Major General Simeon G. Trombitas graduated from the United States Military Academy in 1978 with a Bachelor of Science degree. He was commissioned as a U.S. Army Second Lieutenant in the Infantry Branch. His military education includes: the Infantry Officer Basic Course, the Armor Officer Advanced Course, the Army Command and General Staff College, and the Armed Forces Staff College. He also earned a Master of Science in Security Technologies from the Army War College. Major General Trombitas began his active duty career in the 2nd Armored Division as an Infantry Platoon Leader, Scout Platoon Leader and Company Commander at Fort Hood, Texas. He was assigned to the Joint Readiness Training Center as a Senior Infantry Company Observer Controller. He served three tours in the 7th Special Forces Group (Airborne) as Operational Detachment “A” Commander, Company Commander, Battalion Operations (S3) Officer, Executive Officer and Battalion Commander. Assigned to USMILGP El Salvador he served as Senior Advisor to the 4th (El Salvadoran) Infantry Brigade. He served as the Assistant Deputy Director for Operations of United States Army Special Operations Command and Commander, US Army Garrison, 7th Infantry Division and Fort Carson, Colorado. 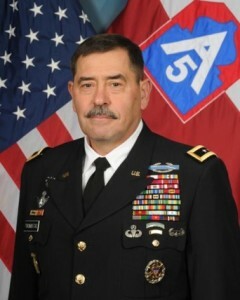 His joint assignments include: Deputy Director of Operations (J3) with Special Operations Command in Panama; Commander, U.S. Military Group in Colombia; and Chief Regional Special Operations Division (J3) in Washington, D.C.
Major General Trombitas has served as a general officer in various duty assignments beginning as the Commanding General of Special Operations Command, Korea. Following Korea, he assumed command of the Iraq National Counter-Terrorism Force Transition Team during Operation Iraqi Freedom. He was then assigned as the Special Assistant to the Commanding General, U.S. Army Special Operations Command at Fort Bragg, North Carolina. MG Trombitas commanded United States Army South from 2009 to 2012, and most recently served as Senior Defense Official / Defense Attaché at the U.S. Defense Attaché Office in Mexico.